Beaver face and hands; photo by Márcio Cabral de Moura on Flickr (noncommercial use permitted with attribution / no derivative works). 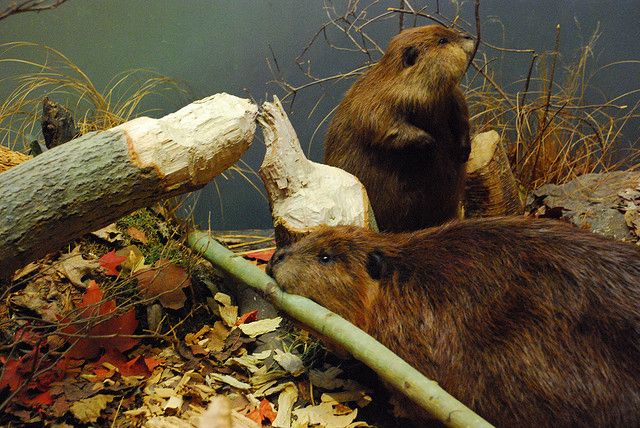 Unique animals with flat tails and lustrous fur, beavers have the ability to dramatically change a landscape. Beavers prefer to dam streams in shallow valleys, turning much of the flooded area into wetlands (almost half of endangered and threatened species in North America rely on wetlands). Known as "nature's engineer," the beaver's dam-building activities are also important to natural water flow and erosion control. 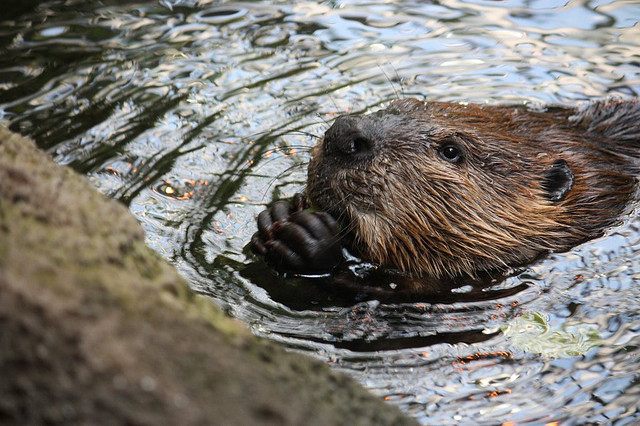 Beavers build dams in order to create a pond in which to build their homes (called beaver lodges). The lodges serve as protection against predators (such as coyotes, wolves and bears) and provide easy access to food during winter months. Beavers always work at night and are prolific builders, carrying mud and stones with their fore-paws and timber between their teeth. The largest known beaver dam (discovered near Three Forks, Montana) was 2,140 feet long, 14 feet high, and 23 feet thick at the base! Native Americans called the beaver the "sacred center" of the land because they create rich habitats for other animals (mammals, fish, turtles, frogs, birds and ducks). They also used the same word to mean "beaver-like" and "affable." An adult beaver may weigh over 40 pounds. Beavers mate for life during their third year and both parents care for the kits (usually one to four). Kits normally stay with their parents for two years, with the yearlings acting as babysitters for the new litter. Beavers were overtrapped by early settlers for their fur, eliminating them from much of their original range. Native Americans and early settlers also ate beaver meat. Through management and partial protection, and the animal's own tenacity, the beaver is reestablished. Beavers building; photo by Mark Round on Flickr (noncommercial use permitted with attribution / no derivative works).